Looking great Mark, I hope your family's health issues are sorting themselves out. I have finished the steering wheel now, Farina horn button wired up just need the battery connected to test. The heat over here though is making even the simplest task taxing! (Apologies to the blighty brothers who are freezing their proverbials off!) Cheers Mark. Managed a bit of work over the last few days, no photos though due not really visual progress. Constructed all the looms for the front clam and first fit in conduit on brackets. Battery refitted and all tested out so no mixups or wiring fails yet. Can start terminating at the lights etc now. Horn checks out as well so all steering wheel now complete and tested. Tried a trial fit of the sills, but with limited room in the garage unable to get the doors wide enough open so left that for another day when the car is pushed out. Got to keep pushing for progress as I don’t know when the surgeon is going to call waving his knife at me with a smile on his face! Oh also had a great weekend at Hahei at the leadfoot festival. If I get a chance I’ll download the camera and see what I can post up, but look on google for leadfoot festival if interested. It is a yearly hillclimb event ona private estate driveway that has been designed by Rod Millen to represent his favourite parts of goodwood, pikes peak and forestry stages. Awesome event with awesome cars. Hi guys, thanks for all the good views and enthusiasm so far! Made progress as planned over the weekend, the heat though is making it pretty difficult to work in, NZ is cooking at the moment! Wired in all the front lights - All working as planned and low/main beam working through the relay's that I have fitted both sides. (Mini auto relay/5 pin) 20amp Normally closed (NC) and 40 amp normally open (NO) side. 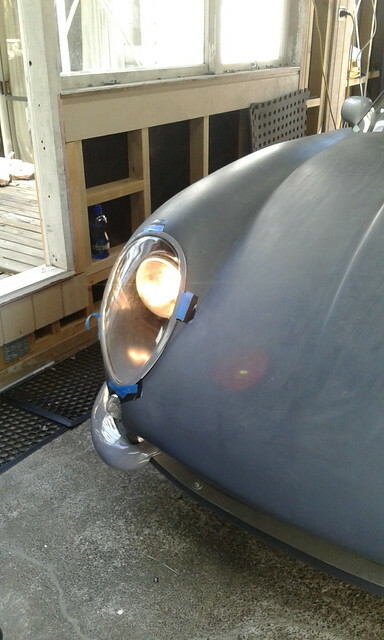 Have rigged the low beam to use the NC side so that it operates normally. Once either high beam is "flashed" or put on with the stalk switch, then that powers the relay switch, uses it to feed the high beam and of course the NC side becomes open circuit and cuts the low beam. 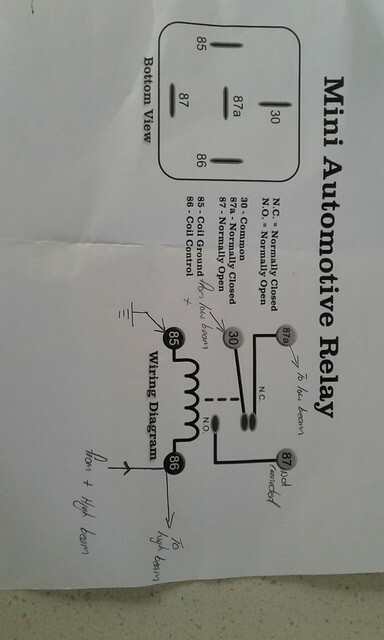 (This is using all the original wiring extended from the front of the car, so all bulb circuits had a +ve and -ve lead.) I have used the low beam ground wire for the H4 plug and the high beam ground lead for the relay switch ground, but it wouldn't really matter either way round. Works well. 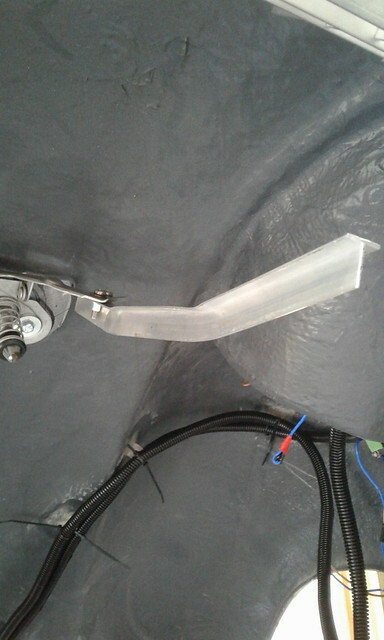 Also extended the bonnet safety catch lever so that I can reach from the grille and pop the catch. Needs a bit of tidying and polishing a bit but works well. 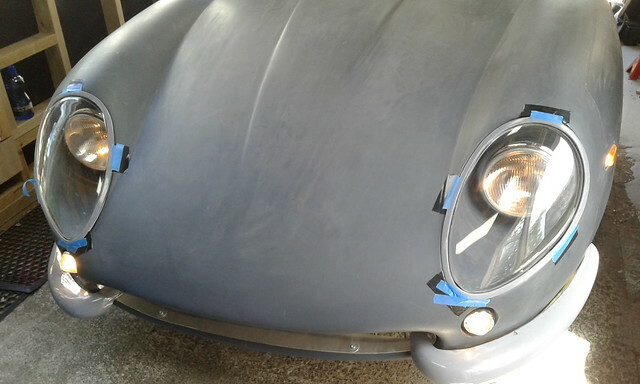 As you can see from the photos - gaffer tape if my friend at the moment to give me an idea of the look! Happy plodding! Dull and raining here so looking at your pictures is a ray of sunshine to me! 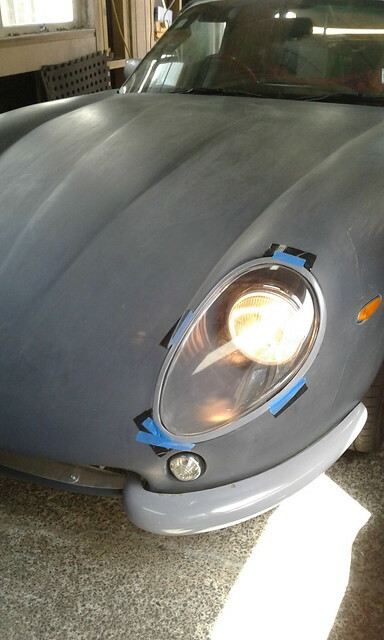 The headlamps fitted with those covers and surrounds look great. Keep at it. Every little task completed moves you nearer your goal. Thanks Froggyman, appreciate the motivation. 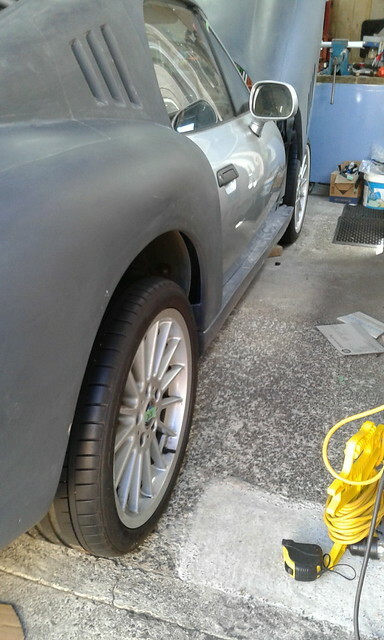 I have the cert guy coming round tomorrow for a good chat on the rear body fixing amongst other things. There are a few areas I may have to do a few mods to for ensuring the certification side is happy. I’ll keep you all posted! Generally though I do feel heading in the right direction just! Cheers. It is great to see this coming together. Keep the momentum going. Cheers Barber will try my darndest! Got together with the cert guy for LVV today, have agreed a few changes that need to be made. Fuel filler needs to be moved from by the rear window and forward onto the rear arch. There is just not enough room to get the filler pipe through in between the roll cage bar and the rear tub construction without removing base metal. So we have agreed to move it onto the arch which solves that issue and the fact the filler was in the boot directly over the battery. Rear body support needs to be modified/improved as the rear boot extension doesn’t give enough rigidity for cert. 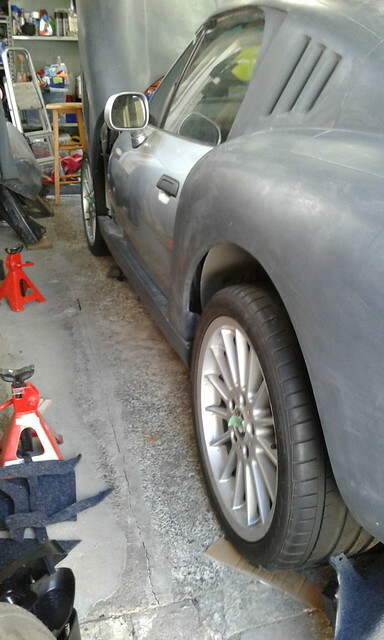 So I am working now changes that are likely to include glassed in brackets for the extension to rear bumper, the rear body onto the original rear guards location and some fixings between the sills/rear arch and in the parcel shelf area. Bit of work but needs must! Have got a bit of work to redo on the front screen area as well as the r/h front screen edge does not fit tight enough because the infill trim I bonded in is slightly in the wrong position. So likely I will have to cut it and take out half, reclean/prep and re affix. 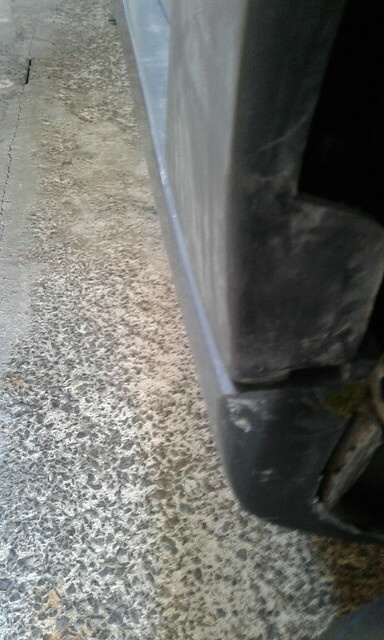 Lots to do as I will have to also come up with a plan/method to seal off the rear wheel arches from the cabin. Better get my fish oil stocked and brain food working! 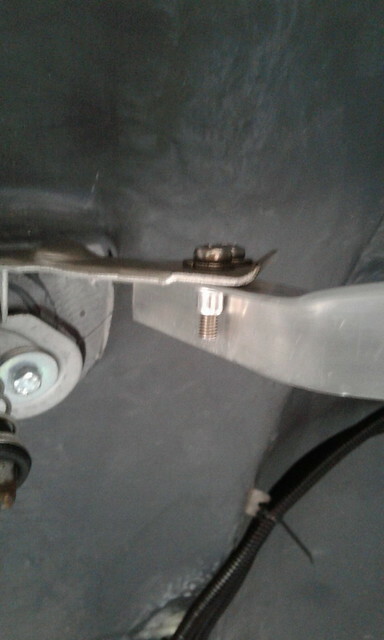 On my build, I turned the alloy bumper strengthener upside down. This gave me a flat boot floor that I was able to bolt the boot infill panel too (with a bit of modification). 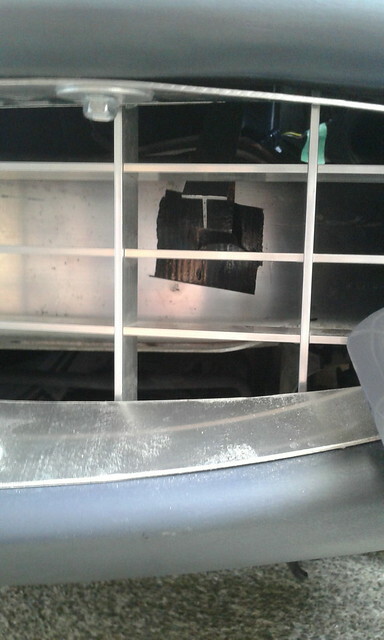 The boot infill panel was strengthened as well and made a great support for the rear body clam. Thanks for the info Jag, i’ll bear that in mind when trying to work it all out. I think I remember attempting to spin it round when I stripped the car and found an attachment bolt seize after half a thread turn. It torqued back up ok but I may be tempting fate if I attempt to get it back off. We’ll see......if I can work out the right heights and use wide enough/thick enough ally angle slotted and bolted I may be able to get the right support and leave it where it is. Thanks fella. small progress today, did a bit of lining up and initial fixing of the rear boot extension so I could get an idea of the gapping/lines/fix of the rear clam body. 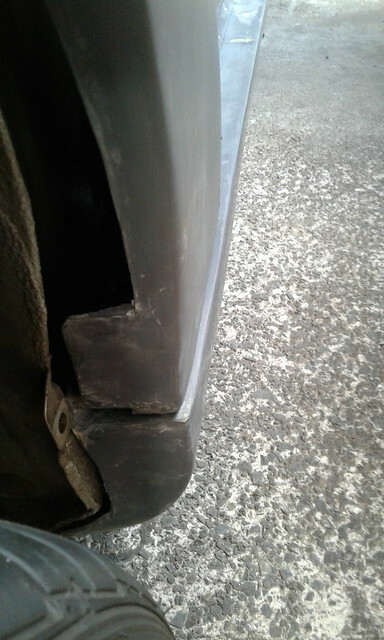 Also fitted the side sills to allow an idea of that initially. Generally ok, maybe a bit of massaging on the sill lines, but the lines do sit evenly when asked to do so. The front clam is a little outwards, something that may be able to be pulled in as there is a bit of flex, might have to be something to live with initially until maybe some adjustments on the bracket. It will need to be spacered in places to fit where I have photographed it. - Decent starting point though! I found doing a trial fit in the middle of the build help keep the motivation going. All the jobs are fiddly and take time and to get a glimpse of the end result does wonders. 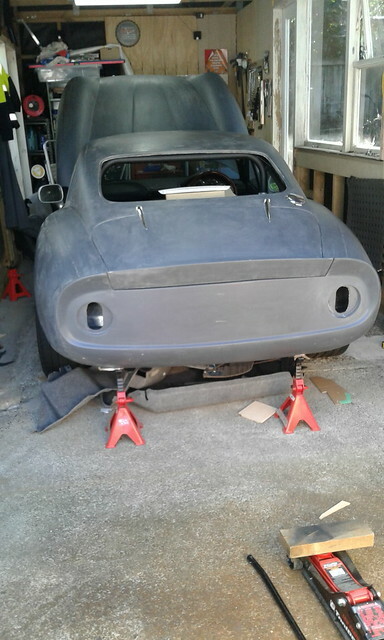 My 250 SWB had the same slight offset to the rockers as your car. I Wedged those corners out to match, ran a single stainless sheet metal screw to hold them and 'glassed them to the rockers. Much cleaner looking IMO. Thanks Molleur good stuff. Hoping to match the sills/rear drops inline and fix once more work done underneath. Does looks if it will push out and line up which is good. Good solution. Just so I am clear though, you are talking about the rear clam when you say “rockers”? Or do you mean the sills? Just never heard the term rockers other than in a valve sense! Cheers fella, M.
Yes, in Americanese "rockers" are sills. Two/ three nations divided by a common language. My knowledge of the terms comes from spending much too long watching car shows from the UK, US and Aus. Current faves are on UTube such as Project Binky, the Mongrel (Ford 100e grafting onto a MX5), MCM and Skid Factory. I was in the states once and over heard someone in a parking lot talking about a "deflationary situation" whilst pointing at his rear tyre ! All times are GMT +0. The time now is 04:32.